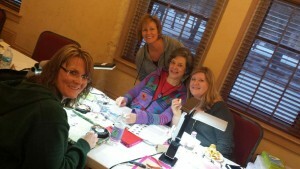 Bead Camp Registration is Open!!! Join us for our first springtime Bead Camp – by popular demand we have added this extra weekend getaway of fun to our normal schedule of winter and fall camps! Bring your projects or stop in the shop for some inspiration and join us for this Friday evening to Sunday afternoon bead time. We’ve got beautiful space for beading, several classes to pick from if you’d like to learn something new and a few fun activities up our sleeve! Sponsored by your friends at Funky’s and held at the DeKoven Center, just minutes from our shop on the shore of Lake Michigan. Our SPRING Bead Camp will be held April 17-19, 2015. We have an exciting lineup of classes, including kiln enameling with Leslie Perrino and new designs by Anna Elizabeth Draeger. Download the flier and registration form and get registered for a fun SPRING weekend!